Cut branches of Forsythia share a vase with a branch of Edgeworthia and a frond of autumn fern. I’m just back indoors from cutting a few branches of Forsythia to take to some friends this morning. It is a wet wintery morning here, and the buds are still tightly coiled on the branches I’ve cut. But a few days indoors will coax them open and fill the room with springtime perfume. 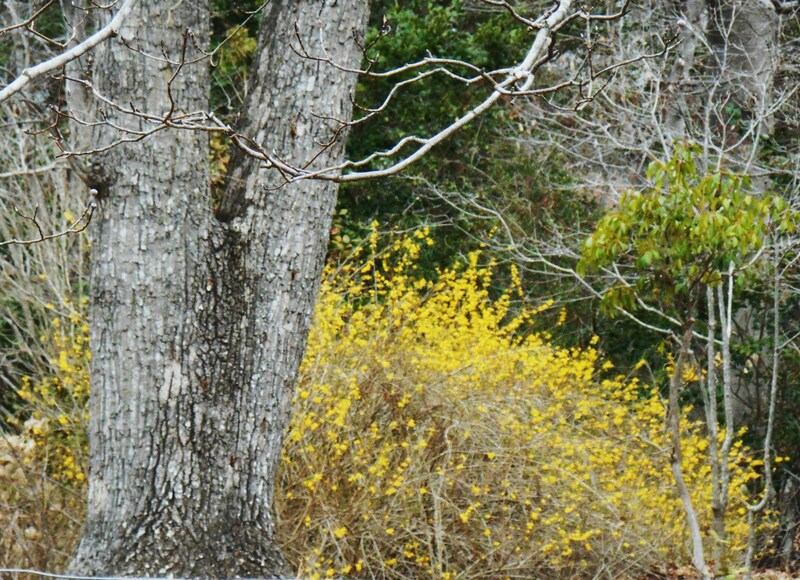 If you need a breath of spring this morning, when so many across our country are under a winter storm, please enjoy reading this post about our beautiful springtime Forsythia, that I found in the Forest Garden archives. Have you noticed the shrubs full of tiny yellow flowers just coming into bloom in our gardens? The first Forsythia shrubs observed in Japan were misidentified by Carl Thunberg in his 1794 Flora Japonica as a new species of Lilac. They are most likely Forsythia. 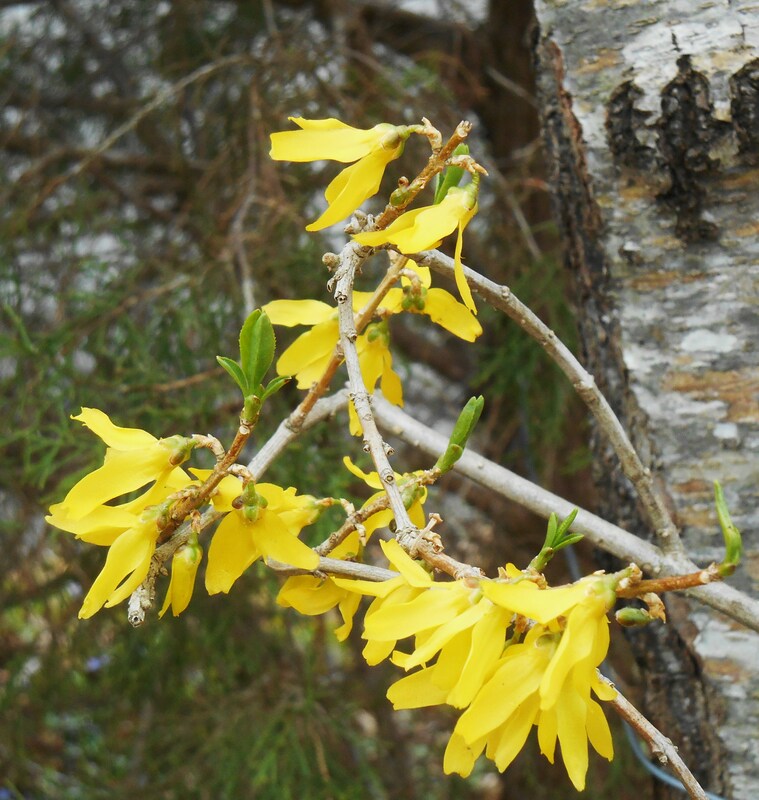 Commonly called by its genus name, Forsythia made its way into the gardens of Europe in the late 18th and early 19th century from Eastern Asia. Found growing in gardens in both Japan and China, and exported to Holland and Great Britain, Forsythia quickly spread from garden to garden on its new continent, and then on to North America. Absolutely easy to grow, Forsythia , like daffodils, gives us a shot of bold yellow in the garden just as we feel like we can’t stand another day of winter’s greys and browns. When I wrote about it, many people explained that it is common and less than desirable in other regions. That rather surprised me. It is rare here, and appreciated by those from colder climates (where it is common and less than desirable). I just panted a few that were divided from a big plant this year. I do not know much about them, but I do happen to be very fond of them. Even though I have not been very far from here, they remind me of something that would grow in some exotic and far away place like Minnesota or Kansas or Michigan or such. I get the best of both, by enjoying plants, and by being snobby about it. I happen to like oleander that those who enjoy gardening dislike so much. They dislike it because it is so common and grows on the freeways. I like it because freeways would be less appealing without it. (They are mostly gone now because of disease.) However, I rather dislike Japanese maple because they are so trendy here, but are not so happy in the climate. To me, the seem so trendy that they are about as common as oleander used to be, but unlike oleander, are not so well suited to the climate. I also happen to be very impressed with the few forsythias that I hae seen here, and can not imagine the sort of mass plantings of them that I hear about in other regions. Isn’t it ironic, Tony, that we seem to admire the rare and discount what grows well and in abundance in our regions? My prejudice is against pine trees, and yet there are some gorgeous Asian and southwest pines that I would enjoy. I don’t like the ones that grow around here like 100ft weeds. We are all a little snobby when it comes to it, and yet I would still prefer the most common grass or shrub to an expanse of desert…. Well, I live among the redwoods, so it is impossible to not appreciate the natives and the common. Technically, oleanders are exotic. They are just disdainful because they used to be so common. I happen to like them because they are happy to grow out in freeway medians where nothing else wants to be. I dislike crepe myrtles because they have become more common than oleanders, but too often get installed where other more interesting plants should go.